What should I know about teaching in Winter Term? how can I stimulate significant learning in a course that is so short? how do I plan for and keep students energized during significantly longer class periods? how can I find time for grading and giving students helpful feedback? How can I cultivate opportunities for effective learning in a Winter Term course? Depth over breadth of coverage. Activities which are engaging and meaningful. What students do in class is at the crux of a successful Winter Term course. As noted above, the three-hour meeting time allows for deeper engagement and focus on elements of the learning process that the full-length semester does not afford. Student success and motivation are linked to activities that clearly connect to the course’s goals and assignments. Instructor enthusiasm and interest in students and their learning. 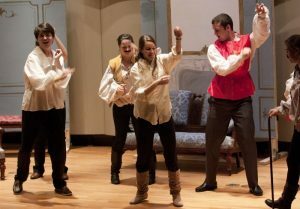 Since its earliest iteration in 2012, students in Professor Olivia Choplin’s French Theatre course have raved about their experience reading, producing, and performing a French play (in French!) helped them connect to passions that they might not have had the time to pursue at Elon while also challenging them. A collegial classroom environment. While creating a classroom climate that is welcoming and inclusive is always important, the compressed format of Winter Term often means that students can get to know each other quickly and well over the fourteen-day semester. Prof. Thurman observed that when her students became comfortable with one another, “they take ownership of the material, and take greater responsibility for their own learning.” For ideas about how you can foster a supportive and engaging environment, see CATL’s classroom climate page. How can I give meaningful grading and feedback (and get enough sleep)? As with the conventional, full-length semester, strategies like determining whether the giving of grades or feedback for activities and assignments is most valuable and creating rubrics to support clarity and efficiency remain useful and applicable. Time-saving strategies such as allocating pieces of work to be completed in peer groups, grading samples of student work (rather than every single item), contract grading, and others can help to reduce stress around grading during Winter Term. For additional information, see CATL’s web page on grading and feedback. Here are some additional tips, many of which connect to the characteristics above. Focus on what your students will be doing, not what you will be doing or the material you will be covering. If you need the students to learn disciplinary content, what do they need to be doing to learn that content (don’t just say “study” but specify what that means); if you want them to be developing skills, how will they do that. Think about scaffolding student work and learning. What supports and structures do they need when they begin, and how can you remove that scaffolding as they become more proficient? How might larger conventional and/or culminating course assignments be reinterpreted as “small wholes,” offering students iterative opportunities to practice and perfect skills? Think about both small and large scale work. Consider both the short, daily activities that students do to practice/learn component parts of your goal, and also the bigger, longer-term integrative activities that students do to put it all together. Be clear with students about why you’re doing what you’re doing. Longer class meetings with more and varied activities require more segues and more explicit attention to the purposes of different student work. We often try to cram in too much. As you proceed, ask yourself if students might be able to go deeper if they were to do more focused work. Long class meetings require a lot of attention, so changing the type of thinking, the style of interactions, etc. can be a good idea. Plan to recalibrate as Winter Term unfolds. Things rarely go as planned. One strategy is planning a “bonus” activity, something purposeful and reinforcing (and perhaps fun) that you can insert if class is going faster than planned and that can be eliminated if you are running behind. Schedule time late in the first week of class to gather and respond to student feedback about what is (and isn’t) helping them learn in the course so far. Take advantage of Elon’s four Winter Term sub-themes: Health, Intercultural Engagement, Media, and Politics. The Winter Term programming website houses descriptions of on-campus events and activities and suggests ways in which faculty and students can engage with the sub-themes. You might also look for courses or intellectual partners whose focus might align particularly nicely with your own course. 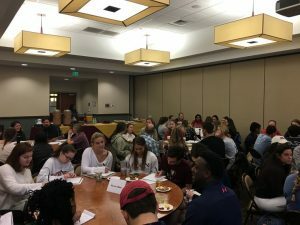 For example, Associate Professor of Human Service Studies Judy Esposito and Assistant Professor of Psychology Sabrina Thurman hosted a panel discussion for their Winter Term courses on fatherhood and early childhood development. Jeffrey S. Anastasi, “Full-Semester and Abbreviated Summer Courses: An Evaluation of Student Performance.” Teaching of Psychology 34:1, 2007, 19-22. John Bean, Engaging Ideas; The Professor’s Guide to Integrating Writing, Critical Thinking, and Active Learning in the Classroom (John Wiley and Sons, 2001). David Gooblar, “The benefits of intensive summer courses.” Chronicle Vitae. Retrieved from https://chroniclevitae.com/news/1016-the-benefits-of-intensive-summer-courses (2015). William J. Kops, “Teaching compressed-format courses: Teacher-based best practices,” Canadian Journal of University Continuing Education 40:1, 2014, 1-18. Virginia S. Lee, “A Rose by Any Other Name? Learning in Intensive Course Formats,” National Teaching and Learning Forum 15, no. 6 (2006). Patricia A. Scott, “Attributes of High-Quality Intensive Courses.” New Directions for Adult and Continuing Education 97 (2003), 29-38. Craig Swenson, “Accelerated and Traditional Formats: Using Learning as a Criterion for Quality,” New Directions for Adult and Continuing Education 97 (Spring 2003). Barbara E. Walvoord and Virginia Johnson Anderson, Effective Grading (Jossey-Bass, 2010). Raymond J. Wlodkowski and Margery B. Ginsberg, Teaching Intensive and Accelerated Courses; Instruction That Motivates Learning (Jossey-Bass, 2010).